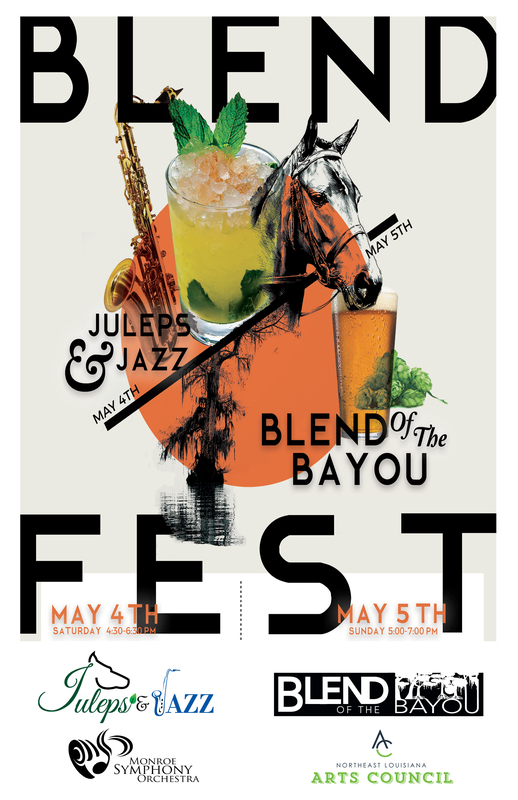 BlendFest – A Blend of the Bayou with some Juleps & Jazz benefiting the arts in Northeast Louisiana. On Saturday, May 4th, kick off the weekend at Juleps & Jazz where you’ll find signature Mint Derby Cocktails and enjoy the 145th running of the Kentucky Derby. Many folks are just as excited to see the historic home where Juleps & Jazz will be held: the King Stubbs-Horne House at 1608 N. 5th Street in the historic Garden District of Monroe features one the most stunningly landscaped grounds and beautiful swimming pools in the entire city. Tour the public areas of the house then make your way outside where you will enjoy a wide variety of delicious food and beverages prepared and served by prominent area chefs, a complimentary selection of fine wines and spirits and fabulous music provided by the LA Jazz Quartet under the beautiful Horne House Pool Cabana. Juleps & Jazz promises attendees an opportunity to dress fabulously (check out What to Wear to the Kentucky Derby and maybe Louisiana-ize it with some creative lagniappe); a chance to participate in raffles and exciting fun derby games— all while supporting Northeast Louisiana’s only symphonic organization, the Monroe Symphony Orchestra along with the community and youth programs it supports. Sleep late on Sunday, May 5th and then head on over to Blend Fest’s block party at 2110 Island Drive in Monroe for Blend of the Bayou. The popular event features a wide array of delicious food and beverages prepared and served by prominent area professionals and businessmen who generously volunteer their time and talents in support of the Arts Council. Blend of the Bayou debuted in 1997 and is the granddaddy of arts fundraising events of its type in north Louisiana. Several of the original 16 volunteer cooks who participated in the first event aren’t ready to lay their utensils down just yet! They are among today’s 25 known as the “men who cook”. Over the years several younger men have joined the ranks and are carrying on the tradition. Since May 5th is Cinco de Mayo this year’s cooks are leaning in the direction of this popular Mexican holiday with their dishes. Add a Mariachi band, a chance to bid on original artwork by some of our leading artists and you’ve got a winning combo for this year’s Blend. BlendFest is two days of good friends, great food, fantastic drinks, grooving music and the opportunity to support two critical organizations that bring art and music to Northeast Louisiana – it’s a win-win weekend for all!